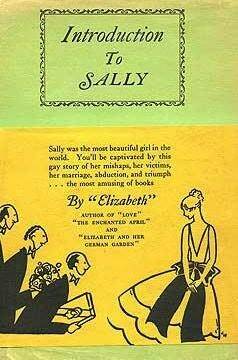 I have been promising a review of Introduction to Sally by Elizabeth von Arnim since I read it in June. Worse, I have been callously and constantly mentioning it since then, enraging those of you who wanted to know more and were waiting on an actual review. Well, rejoice!, for here it is. Mr Pinner was a God-fearing man, who was afraid of everything except respectability. Mr Pinner is an Islington shopkeeper and for years he and his wife have longed for a child. Finally, they have a daughter and, recognizing that she is the answer to their prayers, they name her Salvatia (Sally for short). Unfortunately, Sally turns out to be unusually difficult to raise. She herself is docile and obedient, all that a daughter should be, but she is far, far too beautiful. Her parents have to keep her under lock and key after the age of twelve, once love-struck (or at least lust-struck) men and boys start following her around. All the Pinners’ energy goes into protecting the exquisite Sally, whose unthinking innocence makes her welcome the smiles that come her way even though her strict morals mean she would be horrified if she knew what it was those men wanted from her. It is more than enough work for two people, guarding Sally, but unfortunately Mrs Pinner dies while Sally is still in her teens. Mr Pinner discovers that he can’t run the store on his own, can’t afford to hire help, and absolutely cannot handle the volume of admirers who appear when Sally works there. Seeking a simpler life, he buys a shop in a small village near Cambridge whose chief attraction is an almost entirely female population. Foolishly though, Mr Pinner failed to anticipate the mobility of young undergraduates in possession of motor cars. When Mr Jocelyn Luke enters the shop and falls instantly and desperately in love with Sally, Mr Pinner is horrified. Horrified, that is, until Mr Luke reveals that he wants to marry Sally. Thrilled at the prospect of handing the responsibility for Sally over to someone else, Mr Pinner does all he can to encourage the match and the two are quickly married, the persuadable Sally having been as eager as ever to heed her father’s advice. Now it is Mr Luke’s burden to hide Sally away and he finds the task just as exhausting as Mr Pinner did. ‘Marriage never harmed a man yet,’ said Mr Thorpe still more firmly, aware that he was being inaccurate, but also aware that no one can afford to be accurate and court simultaneously. Accuracy, Mr Thorpe knew, comes after marriage, not before. The story is a farce mixed with a fairy tale. The adventures of simple Sally in ever elevating circles of society (she ends up the protégé of a duke) are delightful and I took a callous amount of pleasure in poor Mr Luke’s hopeless attempts to protect his stunning bride from any male gaze but his. Introduction to Sally is good. Very, very good in fact and very, very unexpected. Von Arnim always manages to surprise me but never more so than here. She has a uniquely sharp eye for the absurdities of humour behaviour and an extraordinary talent for capturing that in dry, humourous prose. Here she is entirely without sentiment or sympathy and each character is more ridiculous than the last. It is pure farce – far purer than I had ever expected from von Arnim who usually balances humourous writing with darker themes – and entirely, wonderfully, hilariously entertaining. Every time I read a review about von Armin I vow that I will extend my knowledge of her beyond my beloved ‘The Enchanted April’ but somehow I just don’t get round to it. But this time…….! Thanks for the push. I hope you do get a chance to expand your knowledge of her soon! I think The Enchanted April is the least impressive of her books so, as far as I’m concerned, you have some wonderful books to discover!!! I think it is far, far, far better than The Enchanted April but then I think just about everything else she wrote was better than that particular novel. 😉 Introduction to Sally isn’t my favourite von Arnim but it is still wonderful and absolutely deserving of a spot on your Christmas list! Sounds delightful! Introduction to Sally is definitely going on my TBR list. I hope to read a lot of von Arnim in the coming year. It definitely deserves to be on your TBR list. It will make a nice break from some of von Arnim’s more bitterly humourous tales if you attack her books en masse. I’ve not heard of this one by her! I will have to search it out since I love von Arnim! It is suitably obscure, isn’t it? I first heard of it from Elaine at Random Jottings but she is the ONLY person who has ever mentioned it to me. Once again, you have reviewed what must be the only copy of a book. It is SOOO frustrating to read your reviews and want to read a book, only to find that it is unavailable on Amazon, Amazon UK, EBAY or any bookstore I can think of on the web. AAARRRGGGGHHHH! Calm yourself and do not fear, it is available on AbeBooks! For once, I did actually check before I posted my review. There are lots of copy at relatively reasonable prices and in good condition. Ah ha. For some reason the author’s name shows up as just Elizabeth with no last name. When I did searches with the last name nothing at a reasonable price showed up on Abe, Alibris or Amazon. How odd! Thank you! Just ordered a copy. Another von Arnim to add to my list – and I see you are reading Fraulein Schmidt too, which I started on my e-reader & then set aside for something else. Oh I hope you do add this to your list, Lisa, and get a chance to read it! It is too funny. I am really liking Fraulein Schmidt and Mr Anstruther, though I’ve just started it. Claire, I definitely agree that The Enchanted April is NOT von Arnim’s best work – I find it slightly odd that it is her best known – can the influence of the BBC film twenty years ago extend this far? Introduction to Sally is delightful, in the very best way. People sometimes use ‘delghtful’ in a slightly dismissive way, but I think von Arnim is supremely skilled in creating delight. Which is your favourite von Arnim? Mine will always be Vera – farce mixed with horror! Erica, I am a firm believer in the reading of delightful books and von Arnim certainly had a gift for writing them! I haven’t read Vera yet (the horror element has scared me off a bit) but my favourites so far are Elizabeth and Her German Garden and The Pastor’s Wife. Oh, I do hope I haven’t scared you off! Vera is very very funny – and very scary. It’s based on von Arnim’s disastrous marriage to Earl Francis Russell, and von Arnim herself thought it was her best novel. 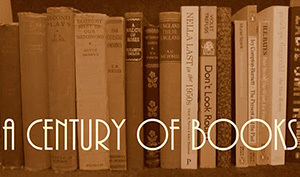 John Middleton Murray described it as ‘Wuthering Heights by Jane Austen’. What better recommendation could there be? !